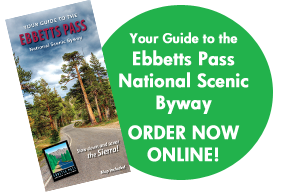 The western terminus of the Ebbetts Pass National Scenic Byway, the town of Arnold offers many amenities including a wide range of lodging, services, and restaurants, and access to two golf courses. Many a visitor has turned resident after experiencing the area’s forests, mountains and lakes. During the early years after the Gold Rush, the Arnold community was composed of two large ranches. The largest, consisting of almost 2,000 acres, was the Moran cattle ranch, where Blue Lake Springs subdivision is now located. The Dunbar Ranch, which encompassed the present community, was deeded to lumberman Willis Dunbar in the 1880s. In 1914 the Dunbar Ranch was sold to H.L. Hunt, who planted an apple orchard of 1,000 trees, the present location of the Meadowmont Golf Course. Much of the area was owned by the Manuel Estate Company, which operated lumber mills in the area and lumber yards in Murphys and Angels Camp. 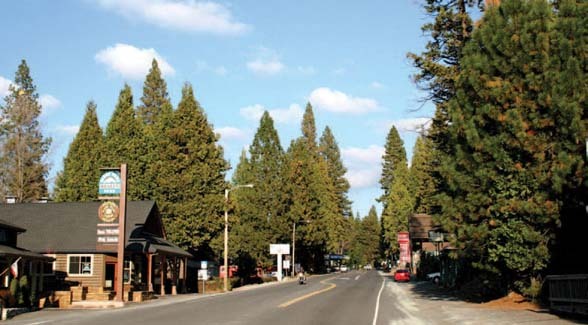 In 1927, Bob and Bernice Arnold, for whom the town is named, arrived and began restoring an old roadhouse and restaurant to serve people traveling over Ebbetts Pass and visitors flocking to see the giant Sequoias in what later became Calaveras Big Trees State Park. 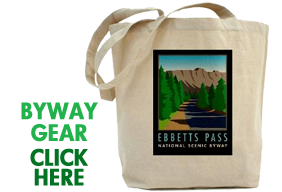 In 1934 they built three cabins, and started constructing the Ebbetts Pass Inn, which opened in 1939. Dave Copello’s general merchandise store was one of the first commercial enterprises, with other tourism related enterprises soon following. Now a quiet mountain community of approximately 4,000 permanent residents, the community of Arnold continues to cater to visitors drawn to the area’s myriad year-round outdoor recreational opportunities, including hiking, camping, cycling, fishing, and winter sports on the nearby Stanislaus National Forest, Calaveras Big Trees State Park and Bear Valley. Arnold is a great base from which to explore the Byway and surrounding environs. The community offers a variety of lodging options, including rental cabins, motels, and bed & breakfast Inns. Many special events, such as the Sierra Nevada Logging Jamboree, live music concerts, arts and crafts festivals, parades, and sporting events occur throughout the year. This area is also home to the Arnold Rim Trail.